AS A BUSINESS WORKING ACROSS A RANGE OF DESTINATIONS OVER 20 YEARS, WE HAVE ALWAYS HAD A STRONG SENSE OF RESPONSIBILITY TO THE ENVIRONMENT AND THE COMMUNITIES IN WHICH WE OPERATE. We pride ourselves on being the bridge between different countries, cultures and traditions on both sides of the Channel. This report aims to demonstrate the values that underpin our business and give you a flavour of the contribution that we believe we are making. From the early days of operation, we have championed the environmental benefits of high-speed rail and encouraged the switch to sustainable modes of transport for short-haul international travel. For Eurostar, reducing the impact on the environment means leading by example. This commitment is embodied in our environmental principles known as Tread Lightly. Over the years we have made substantial progress in reducing our carbon footprint and promoting sustainable travel and this remains a key priority for our teams. 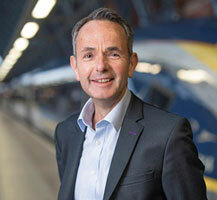 As a high-speed rail operator travelling across the UK, France and Belgium we have also worked hard to ensure that we do not simply travel through but actively engage with our communities. The breadth of our projects is considerable: from our work experience programme and our language skills support to our engineering and customer service apprenticeships, we are finding innovative ways for our colleagues to integrate with our communities. I hope you will find this insight into our Community and Environment Programme interesting and enjoyable. We are proud of all that we are achieving and look forward to building on our commitments over the coming years. © 2019 Eurostar International Ltd. All Rights Reserved.